Hello friends, Today I will tell you on how to check What version of internet explorer do I have? The user can check the version of their Internet Explorer and keep it upto date. You can check the version of the Internet browser on your Windows PC/Laptop. I have shared two methods to check the version of the Internet Explorer. You don’t need to download any external software to check the version of the Internet Explorer. 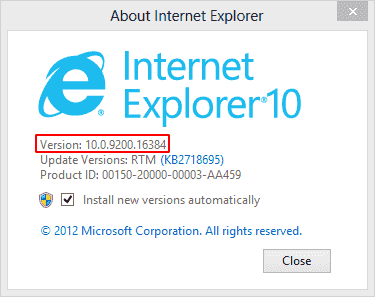 0.1 What is Internet Explorer? Internet Explorer is a web browser which is designed and developed by Microsoft Corporation. It is also known as Microsft Internet Explorer and abbreviated as IE. It is available for Windows, Mac, Solaris, and Unix operating system. This web browser offers for these operating systems for free of cost. Internet Explorer was developed for Unix in the year 2001, Windows in the year 2003 and Mac in the year 2003. However, the initial release was on 16 August 1995. It is available in 95 different languages. Do you want to know that what version of Internet Explorer do I have? Of course yes, right? In this section, I have two different ways to answer your question that is what version of Internet Explorer do I have. Well, you can check the internet explorer version with or without opening it. I have shared both the method so that you can open it to check internet explorer version or if you don’t want it then internet explorer version without opening the IE. I know that you are very excited to know that what version of Internet Explorer do I have. So, without taking your more time let me start the methods one by one you. Using Internet Explorer about tab we can check internet explorer version very quickly. You don’t know the way to check internet explorer version using the internet explorer web browser that is why I have shared this method to you. So, have a look at the method below which I have told you in the most straightforward manner and checked internet explorer version. Open Internet Explorer on your PC/Laptop. Now, click on the gear icon which is at the top right side. Then, click on About Internet Explorer link. After that, you will see a window will popup. At that windows, you will be able to check internet explorer version. 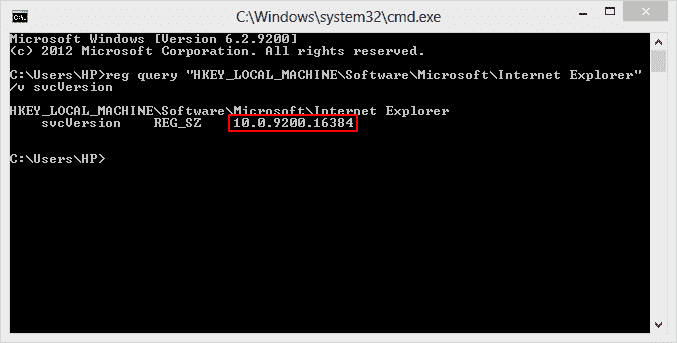 Command prompt has a command to tell you the version of internet explorer. But, the thing comes up here is hat we don’t know that the method to heck internet explorer version using the command prompt. That is why I have shared this fabulous guide with you guys. So, move on to the below guide and explore the steps right now. Open Command Prompt on your PC/Laptop. Now, enter the code which I am giving to you. Type this code in cmd and hit enter. Now, you will see the internet explorer version. These are the methods to get the answer to your question about what version of Internet Explorer do I have. 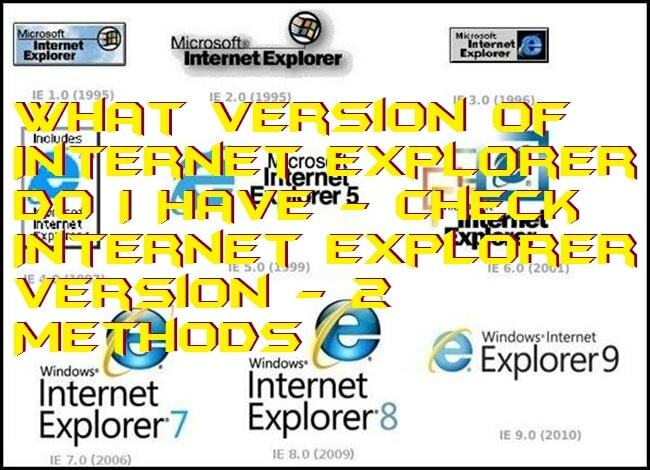 These are the only method to know that what version of Internet Explorer do I have. However, it is a frequently asked question that what version of Internet Explorer do I have, and most of the Windows users don’t know about it. So, I have created this article to tell everyone about the Internet Explorer version. I hope now you have got the answer to your question that was what version of Internet Explorer do I have after reading this article. Let you share this article with your friends also know don’t know that how to check internet explorer version. By sharing this article, you will answer them when they ask what version of Internet Explorer do I have. Filed Under: HOME, HOW TO, Internet, PC/Laptop, Tech Tricks, Top 10, Windows, Windows 10 Tagged With: how do i check what version of internet explorer i have, how do i find out what version of internet explorer i have, how do i find what version of internet explorer i have, how do i know what version of internet explorer i have, how do i tell what version of internet explorer i have, what version of internet explorer do i have on this computer, what version of internet explorer do i have?